One day when I was young and stupid, my brother and I walked down the road together. It was a summer day. I wore a green cap with a white felt M on it, the cap from our little league team. We walked toward the general store, as usual, but that day we walked past it, over a short bridge above the river. Just past the bridge, a road split off from our road and climbed up out of the valley. The house at the intersection of the two roads had spilled things onto the lawn, and they were for sale. We found a box with some baseball cards. The cards were all beaten up and featured players we’d never heard of. This 1970 Luke Walker card was among them. I didn’t recognize the name. He was gone from the major leagues by then, and his brief moment in the national spotlight had occurred years earlier, when I’d been too young to notice. The obscurity of his name and of his worn-away face made the card seem strange and ancient, as if it had traveled through centuries to reach me. All the cards were like this. My brother and I thought we had found mysterious, valuable relics selling for pennies a piece. We thought we’d struck it rich. That was over 30 years ago. Now I wake up early every day while it’s still dark so I can write a little before everything resumes its unstoppable forgettable forward lurch. I usually have about an hour. Sometimes I waste most or all of it. Sometimes I cast around the internet for pieces of the past. Two mornings ago instead of writing I found a newspaper article on Luke Walker from 1971. He’d won 15 games in 1970, and in spring training before the 1971 season he brushed aside a reporter’s suggestion that he was primed to win 20 in the coming year by rhetorically wondering why the reporter was limiting him to that benchmark. Why not 25? This is how you feel when you’re young and stupid. You hold cardboard in your hands and it feels like great riches. You hold a ball in your hands and it feels alive. Luke Walker didn’t remotely approach 25 wins in 1971. He didn’t even reach double figures in wins after 1971, and by 1974 he had thrown his last pitch in the big leagues. One day when I was young and stupid I walked back home with my brother, my pockets bulging with what seemed to be a fortune in unfamiliar currency from a vanished civilization. It was a summer day. I wore a green cap with a white felt M on it. 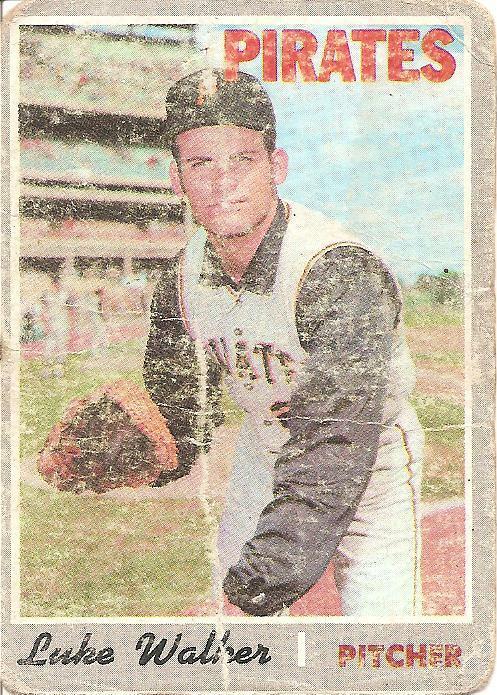 I don’t have that cap anymore, but I still have the 1970 Luke Walker card that was in my pocket, and yesterday morning instead of writing I found a trace of a moment of great promise in Luke Walker’s life. Most of the video containing this trace is taken up by pregame chatter and player introductions, but the very end includes the historic first pitch of the first night game in World Series history. The camera is set up behind home plate, providing a daunting view of the pitcher, a twitchy, bristling lefthander named Luke Walker. He winds and fires, and the ball comes in fast and with a darting downward snarl to it, catching the low outside corner of the zone for a called strike, an unhittable pitch. The game is halted so that a suited lackey can jog onto the diamond and retrieve the ball for posterity, and at that point the video ends, with Luke Walker on the mound under the lights in the World Series, ahead in the count. Back in 1968 I was walking home from a friends house a couple of blocks away. It had rained while I was visiting. As I was walking, something caught my eye. It was a Mickey Mantle card that had washed up against the curb. It was in bad shape. A corner had ripped off and washed away. I picked it up, brought it home and let it dry out, much like Mantle did in his later years. I still have it 44 years later. 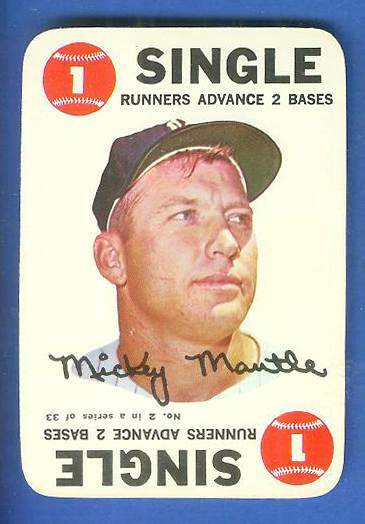 The only Mantle card I have ever had. That was his life at its peak. Then one day someone asked him if his middle name was “Sky” and it’s been all downhill ever since.